My Twitter handle is @foodobsessed6. My obsession primarily relates to dining, but I also have a growing interest in food on a much broader level, including the evolution and future of food. 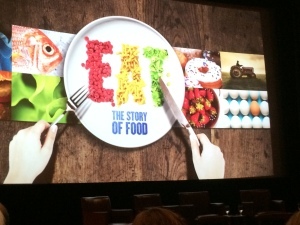 Many of my questions, and yours, are about to be answered in a new six-hour miniseries called EAT: The Story of Food. Produced by National Geographic Studios in association with Creative Differences, the special features interviews with nearly 70 chefs, authors, food experts and food scientists including José Andrés, Rachael Ray, Ruth Reichl, Padma Lakshmi, Michael Pollan, and more. The special satisfies questions about the evolution of food over the course of humankind, from our ancestors throwing raw meat onto a fire for the first time, to teams of lab technicians perfecting the crunch of a potato chip. More important, it will show how this evolution of what we eat and how we eat it has actually defined human civilization and cultures around the globe. 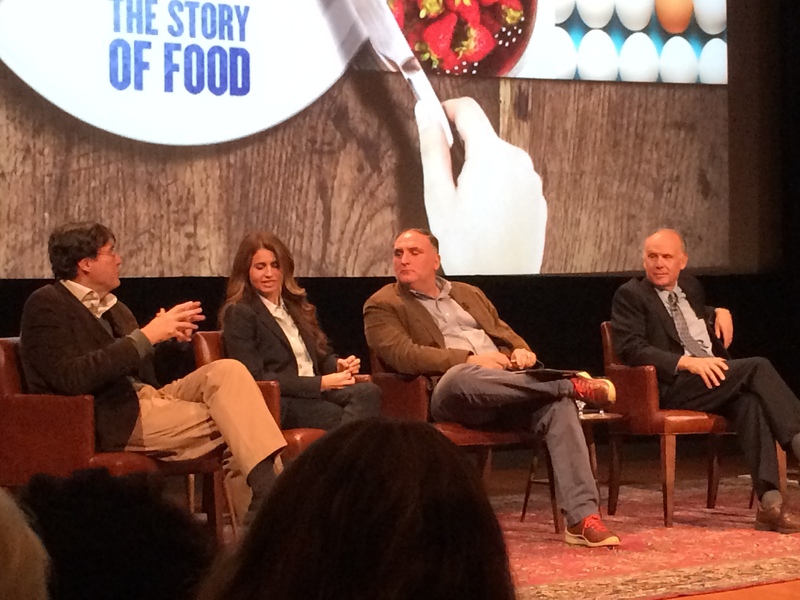 I attended a kick-off event previewing clips from the series and a panel discussion moderated by producer Pamela Wells, and featuring chef José Andrés, primatologist Richard Wrangham, historian Andrew Smith, and Anna Boiardi (granddaughter of Chef Boyardee). Panel members discussed early food memories, including Anna Boiardi who came to the U.S. from Italy as a child. She couldn’t get over peanut butter and jelly. When her mother heard about the sandwich, she thought her daughter’s description couldn’t be right. Chef José Andrés discussed his love/hate relationship with meat. He loves how it tastes, particularly in the first five seconds, but acknowledges there are consequences to eating meat. He is pursuing more vegetarian cuisine, and is said to be opening a vegetable-focused fast-casual restaurant on the campus of George Washington University. He also spoke passionately about GMOs, and the necessity for companies and government to disclose the truth. Andrés gave a shout out to Chef Tom Colicchio who has been active in promoting the rights of consumers to know what’s in their food. Panelist Richard Wrangham wonders if food can eventually enable us to express our differences without violence…an intriguing thought. EAT: The Story of Food premieres November 21-23 at 9 p.m. ET/PT, National Geographic Channel (NGC) . Throughout history food revolutionaries have transformed the way we look at food, cook food and sell food. The unlikely television star Julia Child kicked off the vast food entertainment industry when she appeared on TV to promote her new cookbook and encouraged viewers to demand more from their dinner plates. The story of meat is the story of mankind. One primatologist claims that cooked meat may have started it all. Sugar consumption reflects both our fears about who we are and our fantasies about who we might become. The story of sugar is the story of us. From the deadliest catch to the wickedest tuna, fruit from the sea continues to redefine who and what we are today. It’s the stuff we love to hate: processed food. It has changed what we eat so much that today our ancestors would hardly recognize it as food. The question about embracing or fighting this fast food revolution may be even more important for our future. The discovery of how to grow and cook grain led to the establishment of agriculture, which ultimately allowed humans to end hunter/gatherer practices and settle into the stay-at-home family groups that formed the earliest civilizations. Today grains in their purest form have risen again with a renewed embrace of the natural and artisanal found in a great loaf of bread, an amber mug of craft beer or a hand-tossed crust in a gourmet pizza pie. In addition to this television special, National Geographic Channel and the National Geographic Society are exploring the future of food and celebrating our connection to food through a major, multiyear cross-platform initiative. The initiative grows out of an eight-month series in National Geographic magazine looking at how we can feed our growing world population. The magazine’s coverage is now available as a free iPad app atnatgeofoodapp.com. The initiative has also included two new books, a website at natgeofood.com, an education curriculum, events and exhibitions. EAT: The Story of Food will air internationally on National Geographic Channels in 440 million homes, in 171 countries and 45 languages, as well as on the Spanish-language network Nat Geo Mundo. It will be available on DVD at shop.nationalgeographic.com on Tuesday, December 16, 2014. For more information on the miniseries visit http://NatGeoEat.com, or on Twitter at@NatGeoChannel.